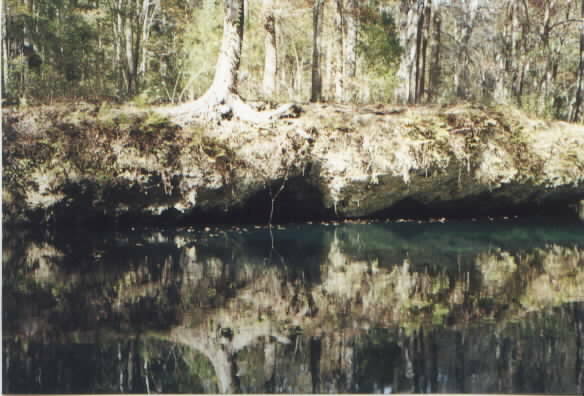 Ichetucknee (pronounced "Itch-tuck-nee")is an indian word meaning "pond of the beaver." The stream was originally home of the indians who hunted and fished here. A spanish mission was once located on its banks. In the late 1800's a grist mill was in operation here. Early travelers on the Bellamy road (built abt. 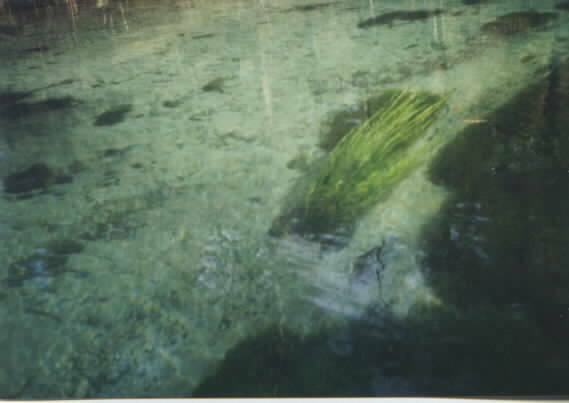 1825) often stopped at Ichetucknee Springs to quench their thirst in the crystal clear waters. Today, this is a 2,241 acre Florida State Park. 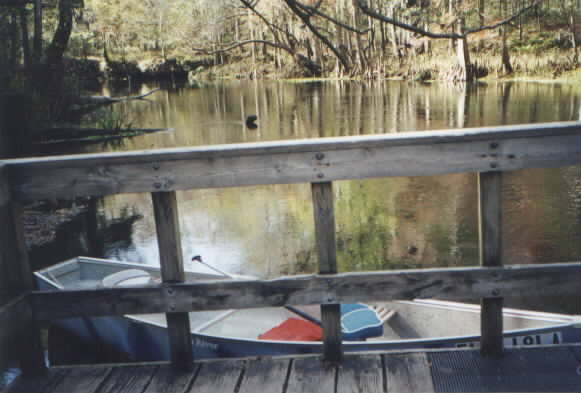 The River runs from the head springs for six miles before it joins the Sante Fe River, a tributary of the Suwannee River. 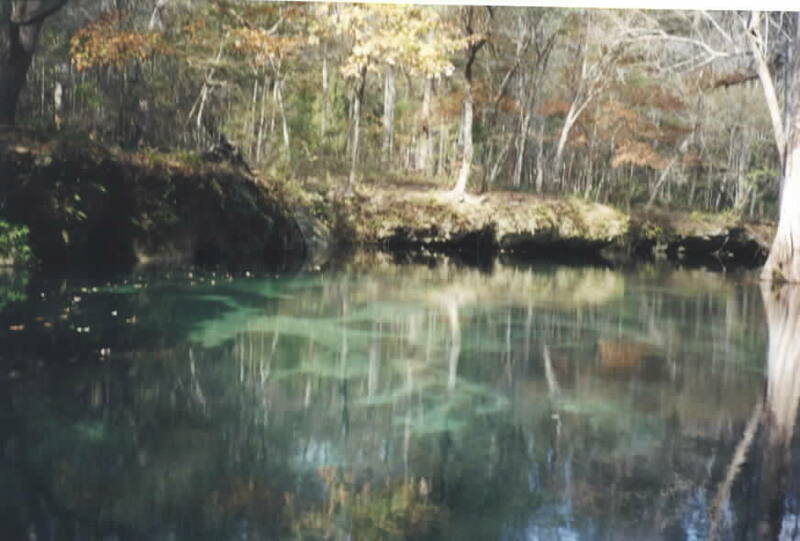 There are nine named springs within the Ichetucknee Springs group. Average total flow of all springs is about 233 million gallons of water daily. The water temperature remains a constant 73 degrees year-round. Famous for it's tubing and recreational activities on the River in the tubing season (Memorial Day Weekend-Labor Day), we find the River most enjoyable in late fall during the off-season for the canoeist who wishes to explore the "real" Florida. We put in our canoe at the Tube Take-out Point of the park, just before the bridge on Hwy. 27 near Ft. White, Fla. During the tubing season this is the final take-out point for the thousands of tubers who float the river from the North Entrance on SR 238. In season, there is transport available back to the starting point. Off-season, you can put in your canoe or kayak and paddle upstream as far as you wish to go and then it's an easy float back to the parking area and your car. We canoed upstream to the "Devil's Den", a series of Limestone cliffs and caves, just across from Dampler's Landing located in the South Entrance of the State Park. An easy paddle despite the swift current, we were rewarded with the serenity of the Autumn forest and the beautiful views of the pristine river. Food, beverages, tobacco and other disposable items are prohibited on the river which is evident in the completely "clean" river - not one trash item was seen anywhere on our trip. We relaxed and stretched our legs on the boardwalk at Dampler's landing where we were able to dock our canoe and check out the forest in the 15 minute walk up to the Public Facilities area. This facility is "open" but completely deserted in the off-season. Water fountains and restrooms are the only facilities available during off-season, a small price for having the place to yourselves in late November. The trip back down the River was an easy 30-minute float, our paddles needed only for steering. Quiet, beautiful, serene. Check out some of the photos of our trip. Ichetucknee Autumn. 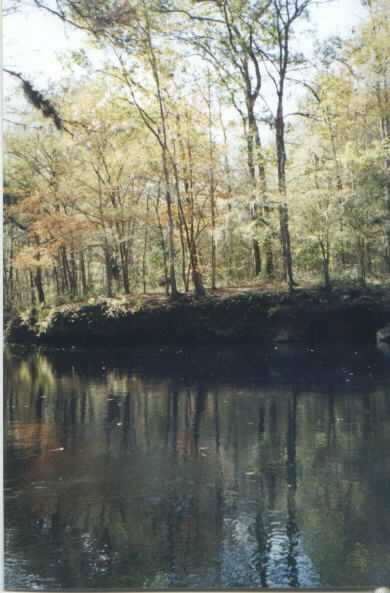 A view of the River in late November, the forest is a Hardwood Hammock with beautiful oak, dogwood, and other deciduous trees that give a unique fall colors scene. The light areas seen underwater are the sandy bottom showing through in the sunlight. The dark areas are boulders, downed trees, and the gorgeous swaying underwater river grass vegetation. 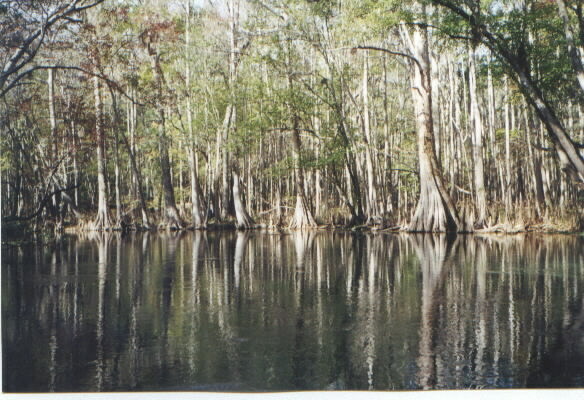 Graceful reflections of the tall cypress trees that line the river add to the forest beauty. 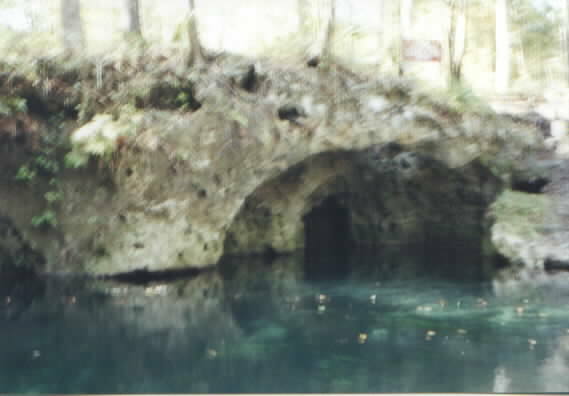 One of the larger caves to be seen in the Devil's Den area of the River tempts closer inspection. Serenity. One word describes the feeling this photo presents. Crystal Clear water. This photo taken from the surface in about 5-6 feet of water shows the river bottom and the clarity of the water. A small patch of river grass sways in the current, contrasted by the pure white sand bottom. Fish, turtles, and otters were seen swimming underneath. I'm sure there must be alligators but we didn't see any this trip. 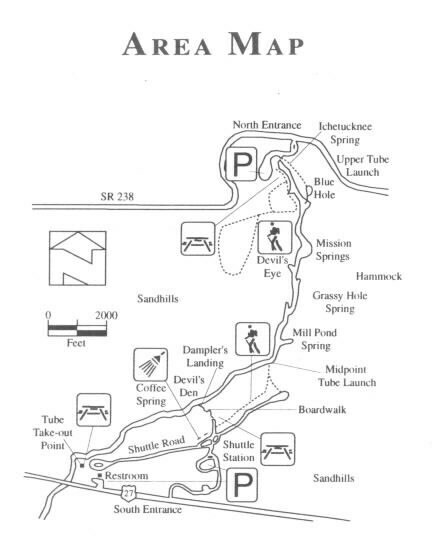 Dampler's Landing, about two miles up the river from the Take-out Point, allows an opportunity to dock our canoe, stretch our legs and get a drink of water and use the restrooms located in the Park Facilities a short 15-minute walk away. The walk up to the Park Area & facilities at Dampler's Landing offers an opportunity to stretch one's legs. In season, this area would be crowded with thousands of tubers entering or exiting the River here. We recommend off-season for nature lovers like us.